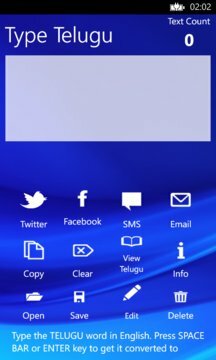 With Type Telugu application which runs on Windows phone, you can READ/WRITE in TELUGU and share it to the world via Facebook, Twitter, SMS and mail with a click of a button!!! 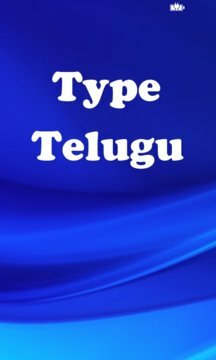 This is a very simple and easy to use app which translates the word you type in English to Telugu as soon as you press Space or Enter key. Also there is a Unicode reader, in which you can read the Telugu messages. Just copy the Telugu text (square boxes) from any website or applications. Then paste it on the Unicode viewer to view the text behind the square boxes. You can scroll to any word you just typed in and make a correction, just by pressing the backspace key - you will be shown the list of most popular mappings for the typed word and you can either choose from the list displayed or can delete the word. Surprise your friends by dropping your favorite line in Telugu on your Facebook page or tweet on Twitter, type an email, send an sms. v1.3 - You can now save 25 frequently using sentences. v1.1 - Added support to both Portrait and Landscape views.